Thierry Isambert Culinary and Event Design is exclusive caterer to The Bass, and operates The Bass Café which is open daily (except Tuesdays) from 10 AM to 4:45 PM. Located in the heart of Miami Beach’s historic Art Deco district and just steps away from sandy beaches and upscale hotels, The Bass is a landmark for its history, and blend of art deco and modern architecture. The beautifully expanded and newly renovated museum is available for private use. Individuals, corporations and non-profit organizations can host innovative receptions, dinners, weddings, lectures and meetings in a unique, upscale environment in trendy South Beach. State of the art spaces, offering a range of flexible options, can accommodate groups of 15 to 250 guests and add prestige to your next corporate meeting or event. Galleries may be opened for your guests’ viewing pleasure. The museum’s entrance leads directly into this beautifully renovated space with 12 foot ceilings and a long-term art installation by Pascale Marthine Tayou. The Cejas Gallery serves as the museum's lobby and provides access to all galleries and space throughout the museum, including a direct pathway to the Lindemann Family Courtyard, Multimedia Lab and restrooms. Ideal for cocktail receptions of up to 200 guests. The Bass's largest rental space, the Lindemann Family Courtyard offers flexible options for receptions, dinners or meetings and features architectural elements of the original Art Deco building. The L-shaped indoor courtyard with its soaring 29 foot ceiling invokes a piazza-like character which is sure to impress your guests! The Bass's newly renovated Creativity Center offers a multitude of possibilities for private and corporate events. A private entrance leads to three multi-purpose spaces – the Waterview Classroom, Rotunda Classroom and Multimedia Lab. In total, this new configuration creates 4,200 sq. 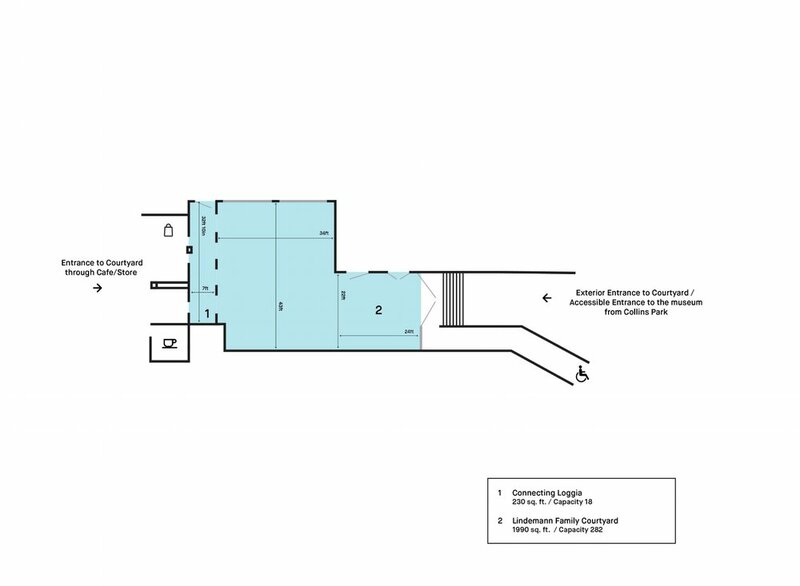 ft. of usable space, along with a 1,000 sq. ft. outdoor terrace. 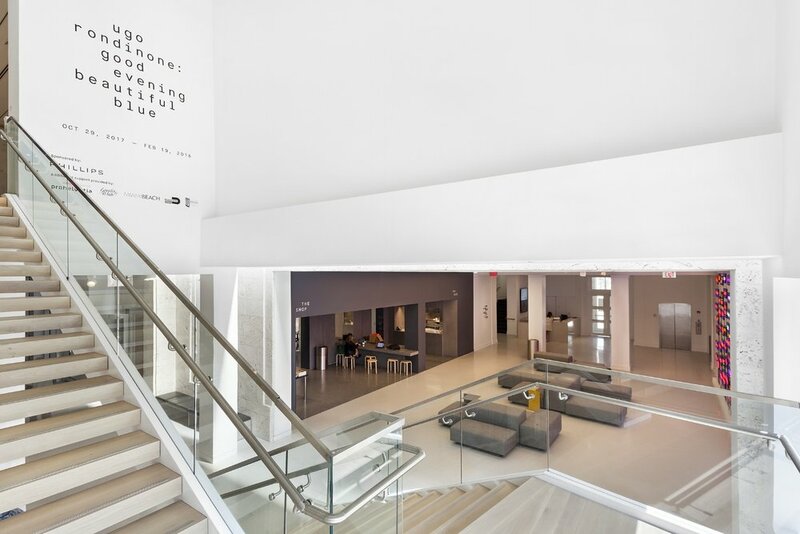 The complex boasts innovative artist installations in each area, a private terrace, family restrooms, as well as information screens and digital signs for your use outside each space. Food and beverages are permitted throughout the Creativity Center. See below for individual information on the three rentable spaces in the Creativity Center, which can be rented together or separate. CAPACITY: 260 | DIMENSIONS: 4,200 Sq Ft (Indoors;) 1,000 Sq Ft (Outdoor play-area terrace;) 5,200 Sq Ft (Total) | FEATURES: Floor to ceiling glass windows; Natural light; Interactive artist installations; Portable AV equipment available; Separate entrance; Presentation set-up; Seminar set-up; Food & beverage permitted throughout. Click here to read about recent events at The Bass, such as The Bass BALL, the Grand Opening, the Michigan State University Gala and the Duke Alumni Panel Discussion.